Feel free to adjust the size you need, with four rotating wheels carrying objects that allow large furniture or washing machines and household appliances to move quickly and easily on any smooth floor. When you want it to stay still, rotate the fixed four-legged screw ring to make seamless contact with the ground to ensure safety and stability. You can easily and safely place the dryer, washing machine and refrigerator on this versatile base. Made of stainless steel and high-strength plastic steel, it has a load-bearing capacity of 300-500 kg and is stable and easy to assemble. Rotate the four-legged screw ring to adjust the height. When the ground is not flat, you can adjust it to the desired level. The length, width and height can be adjusted freely to meet the size of the washing machine, dryer, refrigerator and air conditioner base. 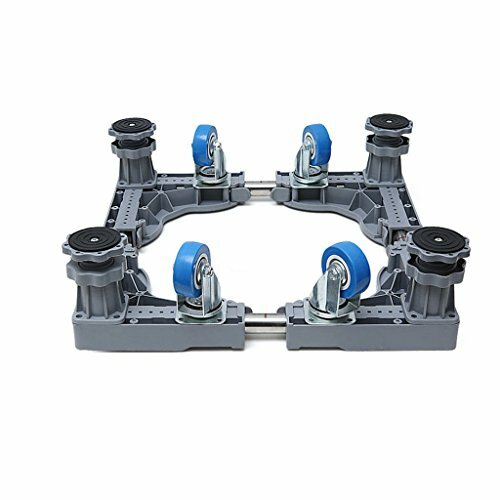 The multi-leg support is stable, the anti-slip increases the silent caster/foot pad and the floor seamlessly, and the embedded horizontal device makes the placement more stable. Pull out the four corners centering on the scale and tighten the 8 screws. Feel free to adjust the sitting size, which can be rectangular or rectangular. Installation is simple and convenient, it only takes five minutes to install. ★ 360 degree mobile base, anti-corrosion, anti-rust, moisture-proof, anti-leakage, sturdy, durable, adjustable size, super rigid, stamping resistant, stable base, easy to clean dust, movable, 360-degree rotation, multi-foot support. ★ Color: A white, B gray; simple assembly, screw fastening, suitable for large appliances, portable washing machines, dryers, refrigerators, cabinets and air conditioners. ★ 4 rubber rotating wheels make large furniture or washing machines and household appliances move quickly and easily, and the fixed feet can be fixed in a fixed direction. ★Slip-proof panel pad, groove design, embedded horizontal device, make the support more stable, prevent the washing machine from accidentally shaking, mute the floor mat, not scratch the floor, the support is more stable. If you have any questions about this product by NUBAOdizuo, contact us by completing and submitting the form below. If you are looking for a specif part number, please include it with your message.